"I have been going for 4 weeks now. Intense.....but well worth it! I have had classes with Nez, Mike, Oleaun, and Mel.....love them all. Mike by far is the most intense. But I love how he shows you how to do the technique the proper way but he goes HARD LOL!!! Love the staff very friendly. Mike Lemaire was born and raised in France where he started Martial Arts at the age of 4. He first studied the Japanese art of Judo then later moved onto Karate and Kickboxing at the age of 12. 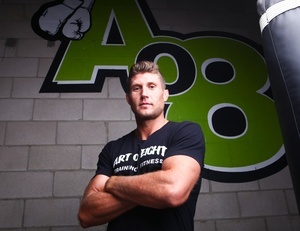 After moving to the US in 2005, Mike Lemaire began training in Muay Thai in Boston then later in Hawaii then in 2007 he started training in San Diego under former 6 time Muay Thai World Champion, Krun Anan Borisut. After a short amateur career with a perfect record of 8-0 with 8 KO’s Mike met with Melchor Menor in 2011 and together started Mike’s professional career. Mike Lemaire quickly earned a name for himself winning the US Road to Glory tournament ( 3 fights in 1 night) which earned him a contract with Glory Kickboxing, the premiere Kickboxing League in the world. After winning the Road to Glory tournament, Mike was offered an opportunity to fight for the WCK Cruiserweight Muay Thai World Title which he graciously accepted and came out victorious. Later that year he took on the prestigious WBC Muay Thai National Title which he won in impressive fashion with a first round TKO via vicious leg kicks. Soon after, Mike faced the then current Chinese champion in Las Vegas where again he won by leg kicks in the first round to become the WLF World Champion. Mike currently holds a professional record of 18 wins with 3 losses and continues to face top competition fighting under Glory kickboxing organization.